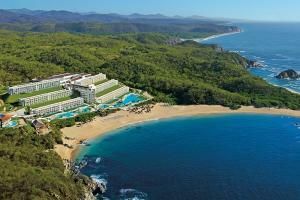 Secrets Huatulco is carved into the foothills at the edge of the glistening shores of the Conejos Bay. With its golden sand, beautiful rock formations and sapphire waters, beautiful Conejos Bay is home to this luxurious adults-only resort. 399 gorgeous oceanfront suites feature a premium mini bar, furnished patio or balcony and spectacular views, while select suites have an outdoor Jacuzzi or swim-out pool access.